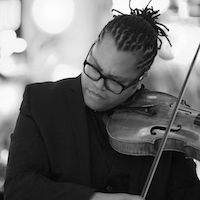 Viola and viola d’amore player Clifton Harrison has performed as a chamber musician and recitalist throughout the United States, Central America, Asia, and Europe. He studied at the Julliard School (New York) with Dorothy Delay and Karen Tuttle and at the Royal Academy of Music (London) with Yuko Inoue and Jane Rogers (baroque). He is the violist in the acclaimed Kreutzer Quartet and is Artist-in-Residence at Goldsmiths University, Bath Spa University, and University of Southampton. They also perform regular concert series at Oxford and Cambridge Universities. Clifton has given masterclasses and workshops throughout the UK, USA, and Asia. Currently, he is also a member of the Rambert Dance Company Orchestra and records extensively for television and film. Described by the Chicago Tribune as “the one to watch”, Clifton has performed concerts in America at Carnegie Hall, Lincoln Center, Zipper Concert Hall (Los Angeles) and Symphony Center (Chicago). In London, Clifton has been heard in all the major concert venues including the Wigmore Hall, Kings Place, Royal Albert Hall, the Barbican, and London's Southbank Centre. Performing as a soloist with leading orchestras in the Americas, Clifton has also appeared as a soloist in the UK and Europe under Sir Mark Elder and with the Rotterdam Chamber Orchestra. Recently, Clifton presented concerts in China, Korea, Denmark, and Austria and recitals in New York and Chicago, Kings Place, Malta Music Festival, and the Royal Opera House, Covent Garden. With an interest in historical performance, Clifton performs regularly on viola d’amore and baroque/classical viola throughout the UK and abroad. With extensive training and experience in multiple genres of music alongside his work in the classical field, Clifton has recorded and toured with international artists like Björk, (European tour), Jeff Lynne's ELO (Glastonbury Festival), and at the London Jazz Festival. His professional orchestral career began at the age of nineteen as a member of the New Jersey Symphony (USA), he then joined the pit orchestra of Disney's Beauty and the Beast on Broadway (violin) and later the Orchestra of the Lyric Opera of Chicago. Clifton is the former principal viola of the Mexico City Philharmonic and Orquesta Sinfónica UANL in Monterrey Mexico, and has worked in the UK with the London Symphony Orchestra, Orchestra of the Royal Opera House, English National Ballet, London Mozart Players, Royal Philharmonic Orchestra, and the Scottish Chamber Orchestra. Recent releases are on the Universal Music, Sony, NAXOS, Navona Records, Métier, and Signum Classics labels.